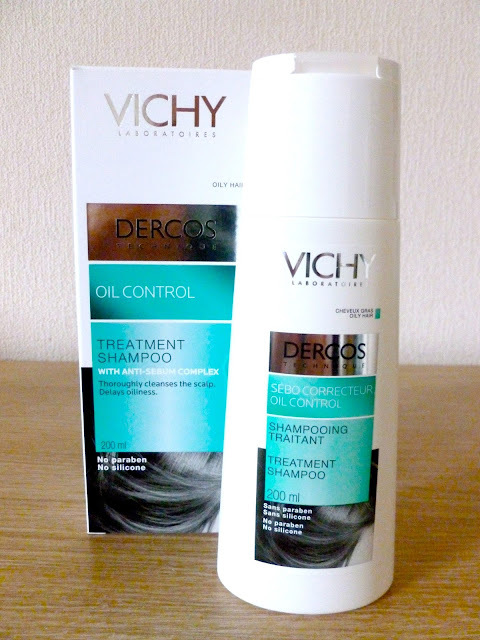 I was recently browsing the Look Fantastic website as I often do, looking at shampoo's for oily hair again as I often do and I came across a shampoo I'd never heard of before, the Vichy Dercos Oil Control shampoo, I love Vichy as a brand and adore their skin care products so I was intrigued by the shampoo I noticed it was on sale for £5.30 down from £8.50, I also had a 15% off discount code so I thought I'd try it out. I've been on the look out for a good cleansing/clarifying shampoo since my favourite Ojon detoxifying shampoo was discontinued and I have recently been purchasing the Boots expert build up removal shampoo, I have a full review of that here but I am still on the look out for something I like as much as the Ojon so I thought I'd try the Vichy out. Greasy hair is caused by over active sebum production, which irritates and destabilises the scalp, hair quickly becomes limp, dull and lifeless. An exclusive anti sebum complex combines 4 carefully balanced and selected surfactants to help limit the spread of sebum along the capillary fibres and preserve the scalps natural balance. The results are that the scalp is cleansed, the hair becomes greasy less quickly, hair feels lighter and becomes easier to style. For 80% of users the shampoo helps give more volume and body. My first thoughts when I used the shampoo were that it had a nice scent, often detoxifying shampoos can smell rather unpleasant but the Dercos has a nice fresh scent to it, I didn't need a lot of product and it lathered up well and rinsed out easily too. The shampoo is a clear liquid and what I would say is an average shampoo consistency it isn't too thick or too thin either. I washed my hair once with the shampoo and it was dried and styled as normal. I am so impressed with the shampoo, I washed my hair for the first time with it on a Monday and wore it down after it had been dried and straightened, the day after my hair looked fine and I was able to wear my hair down again after having it quickly straightened, I didn't need to use any dry shampoo at all in my hair, on Wednesday I wore my hair up and used dry shampoo around my hair line and at my crown as it was a little oily but not terribly, I wouldn't have been able to wear my hair down but it was fine to wear in a messy bun with some dry shampoo through it, I then washed my hair on the Thursday. 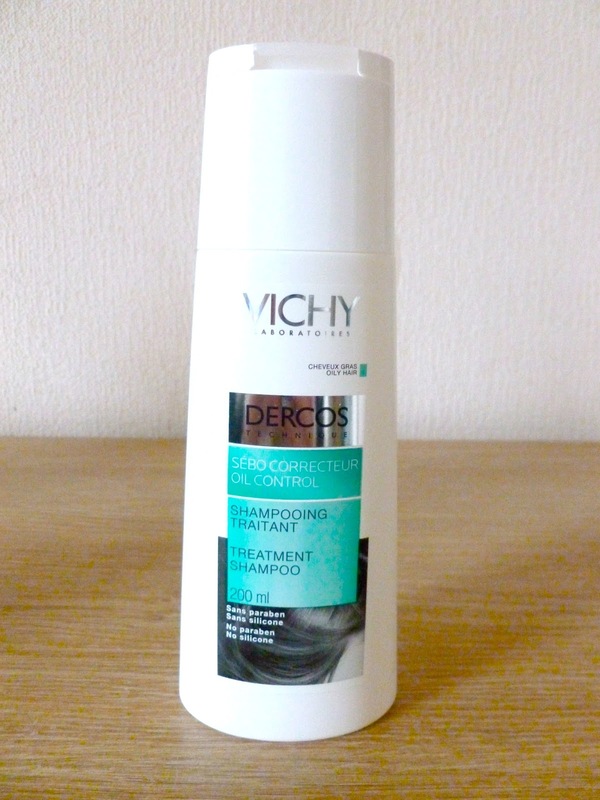 As I said I have been purchasing the boots expert shampoo and using that I can go every other day without washing my hair so I was able to go an extra day without washing with the Vichy which was exactly the same as when I used the Ojon shampoo so my first thoughts were extremely good. 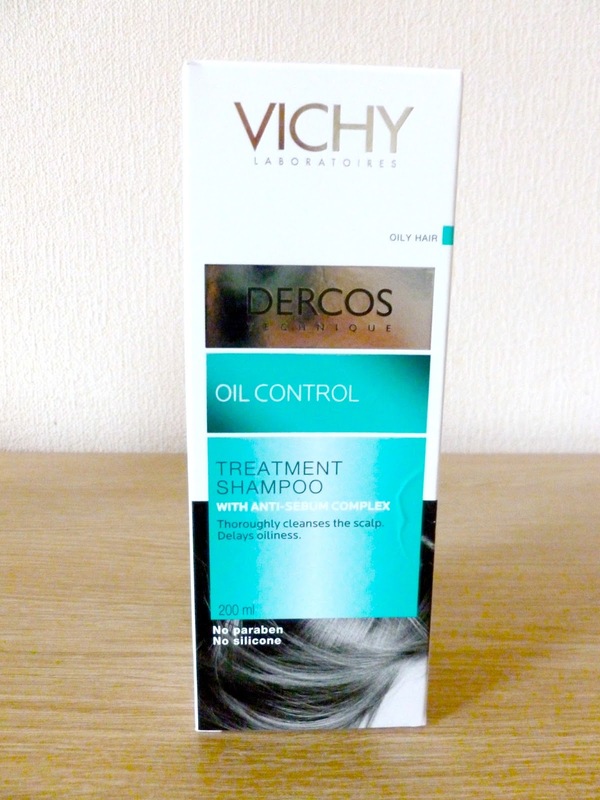 I am super impressed with the Vichy Dercos Oil Control shampoo, I have been using it for a couple of weeks now and I love it, I love the scent of it and it lathers up well, rinses well and it doesn't contain any parabens or silicone which is great and I think the price of the shampoo is good considering it doesn't contain silicone as usually shampoos that don't are more expensive. It is a shame it is more than double the price of the boots shampoo I have been using but it is a better product and it does exactly what it says on the tin, it didn't affect the colour of my hair either which I was super happy about, some clarifying/detoxifying shampoos can strip the colour if you have coloured hair but the Dercos didn't do that so I was pleased about that. I would recommend the dercos shampoo to those of you who suffer with oily hair, it is a fantastic product and does exactly what it says it will, my hair didn't need washing for 2 days and it felt soft and weightless, I am super impressed with the shampoo and will definitely re purchase it, if you can find a discount code for the Look Fanstatic website even better but I wouldn't have any qualms about paying full price for the shampoo as although it is more expensive that the boots shampoo it is a lot more affordable than the Ojon and other brands and it is a fantastic product, to be honest I would have expected it to be more expensive than it is and if I ordered from boots with delivery it would work out to a similar price anyway. I am really pleased I found the shampoo, I thought it would be good as I love Vichy skin care but because I haven't ever heard anything about their shampoos I was a little unsure but I had no need to be as it is fantastic and I have yet to find product I dislike from the brand, another 10 out of 10 to Vichy. If you would like to try the Vichy Dercos Oil Control shampoo you can find it here for £8.50 including free delivery. Do you suffer with oily hair? Did you know Vichy had a range of shampoos? Let me know in the comments, it's so lovely to chat to you all.